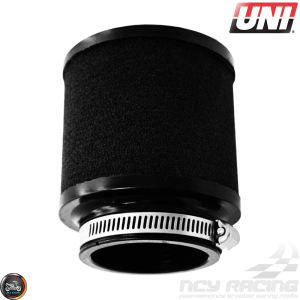 Description: Uni-versal Air Filters is where it all started over 45 years ago. 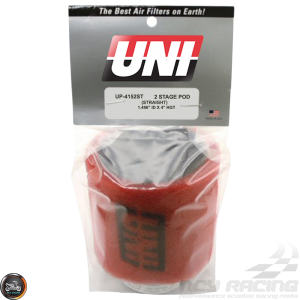 High-Quality Dual Layer Foam (black and red) Pod Air Filter made by UNI. 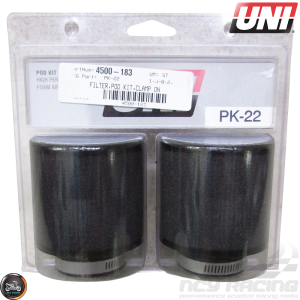 Make the world’s best quality filter that clamps directly to the carburetor. UNI's signature red foam to give your scooter that race-ready look. Also, for use on air compressors, go-karts, motorcycles, snowmobiles, tractors, anything with a carburetor can benefit from a Uni Pod Air Filter. It’s superior dirt capturing capabilities and its capacity to be easily cleaned and reused. NOTE: Before use and/or cleanse (Part# 172-3) and reuse inner filter (black) must be oiled (Part# 172-2) for proper filtration. 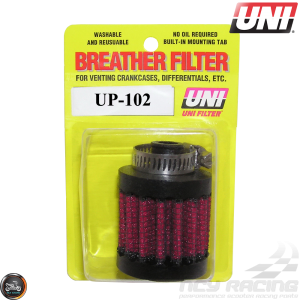 Use outside (red) prefilter dry for dusty conditions or oiled for wet conditions. Jetting changes may be required due to the increased airflow. Includes the following Pod air-filter and Clamp. Supported Models: GY6 152QMI 157QMJ 161QMK 161QML Chinese Scooter, ATV, Genuine Buddy, Kymco, Polaris RZR 170, Ruckus, Vento, and virtually any engine with these measurements. GY6 longcase length: 17-7/8 inches Description: Naraku Brand Premium CVT Drive Belt size 835-20-30 are made in Taiwan, not China version. Its material.. Description: G- Carburetor CVK Main Jet Kit for 139QMB 49/50cc+ and GY6 125/150cc+ carburetors and 250cc 4-stroke water-cooled 172mm carburetors, incl.. Description: High-Quality Taida Cast-Iron Cylinder 61mm 171cc with Forged Aluminum Piston offer better durability and reduced friction for GY6 125/150.. Description: NCY 30mm CVK Carburetor made by Keihin for your GY6 150cc scooter. Includes auto choke. This carb will help your performance engine breat.. Description: Naraku Compression Spring aka torque spring do a couple of things. First, they supply the pressure to engage the belt. They also determin.. Description: Naraku Compression Spring Seat for QMB139 50cc 4 stroke engines. 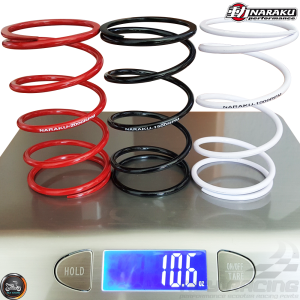 Naraku Compression Spring Seat aka Naraku Secondary Spring Seat will all.. 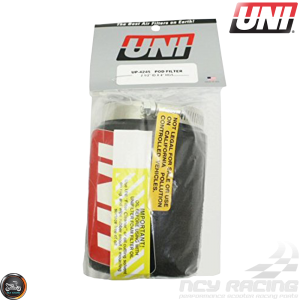 Description: NCY Intake Manifold Coated EGR 30mm offers a smooth bore and larger inlet diameter over stock. Combined, these two assets allow more air .. Description: GY6 30mm CVK Carburetor for 4-stroke 125\150cc.Features:• Auto Choke• Accelerator Pump• &..